The last year or so is, to borrow from the mistress of dignified understatement, “not one on which I shall look back with undiluted pleasure“. As I think often happens with us humans during the more traumatic parts of it I soldiered on because there wasn’t much choice but in the past few weeks, as the cascade of dramas that began with my mother giving herself a life-altering traumatic brain injury and ended (hopefully) with an illness of my own, came to a halt, I had a minor meltdown. From the blog’s perspective (and if I am totally honest to my own deepest concern) the troubling aspect of this is that I have been unable to read more than a few pages. In an effort to pull myself together, or at the very least tidy up a bit, I went around the house this morning collecting all the books I’ve started but not got more than two dozen pages into in the past few weeks. Apart from being a bit surprised to discover just how many spots I’ve found to attempt to read (it’s a pretty small house) I was disturbed to find there were 21 books in a part-read state. And I couldn’t tell you a thing about any one of them. I’d started to worry I had somehow forgotten how to love reading. So perturbed was I by the notion that this was to be a permanent state of affairs that when an advance copy of a book by one of my favourite authors arrived a couple of weeks ago I hid it in the linen cupboard (don’t ask). If I couldn’t read that book my obviously addled brain thought, then I might never read again. Of course I ought to have had more faith. This morning was a glorious one here in my corner of the globe and I took myself off to a nearby coffee shop to sit in the early morning sunshine and embark upon the latest adventures of 1930’s artist, social activist and crime solver Rowland Sinclair. Two coffees and some raisin toast later I was half-way through the book before I reluctantly gave up my coveted spot and proceeded to the chores that Saturday mornings demand. I finished the book this afternoon. So it seems my love of reading only took a hiatus. 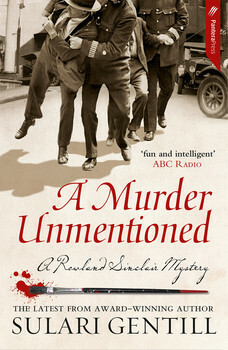 A review of Sulari Gentill’s A MURDER UNMENTIONED will be forthcoming a little closer to the novel’s release date of November 1st. In the interim I offer a virtual but heartfelt thank you to its talented author and her delightful creations for enabling me to be back where I feel most at home. With my nose buried in a book. This entry was posted in musings, Sulari Gentill (Aus). Bookmark the permalink. I sometimes go through such periods – and even if I finish the books, I’ve not really enjoyed them or remembered them. Glad to hear you got your ‘mojo’ back! Congrats on your recovery, and sympathies over the bad spell. That sounds like good news after hard times – so pleased for you. I am so sorry to hear of the issues with your mother’s health and your own. A few months ago I had a brief but very scary medical event, and one thing that bothered me a lot was how it affected my reading (as in impossible for a few days and slow after that) and I think it has continued to affect my energy level to go much beyond the necessary. This scares me as I get older. Reading is so important to me too. And I have to catch up on the Rowland Sinclair series. I had that I-can’t-read-I-must-read feeling when my husband was seriously ill and it’s awful. Rereading something I’d liked years ago sort of worked – I couldn’t settle into anything otherwise, and the words would vanish as soon as I put the book down. But it’s very strange when the thing that usually is so satifying and even soothing fails just when you need it most. Here’s hoping for a much better year for you. Glad the reading drought seems to be broken at last. Bernadette, I am very pleased you have regained your enthusiasm for reading after a rough period. I agree sometimes think we ask too much of ourselves in trying to go on with normal activities when we are hurting mentally or physically, or both. I don’t think it was a bad book, but a combination of death and illness among relatives and friends, and the terrible events going on in the world resulted in my total inability to concentrate on reading and chucking the book. My solution was going to authors like Agatha Christie [they are of a reasonable length] and Deon Meyer, and new discovery Philippe Georget, because I know I will enjoy them without overstraining the little grey cells. Hope you continue to enjoy your reading. Welcome back, in every sense I hope. Welcome back to the world of reading. I, too, live with a fear I won’t be able to read as I age. I’m already reading so much more slowly than I did. I went through a period where I read no books in July, 3 in August and 1 in September. Not back to my 6 books a month at all. And every time I think I’m ready, I have to do something else or else, and I admit it, I was enrapt in European and Austrailian TV episodes over here — Italy, Sweden, Wales, England, etc. I was hooked. 400 minutes of Hinterland over a weekend is pleasant, but can get tiring and intense. I hope you’ve gotten your mojo back and can put your troubles on a back burner. I think you are wise to just let it flow, Tracy. Maybe you have needed the time away from books to focus on your own ‘story’. When the time is right to delve into other worlds, I will bet it will feel organic and true. Hang in there.